Aren't my new bracelets perfection? The totally sweet (and gorgeous!) Cassiday Proctor from the JB & Sandy Morning Show sent me a Twitter message telling me that her mom Debbi makes Scrabble bracelets. I know, right?! I had to know more! I met Cassiday Saturday at Flightpath for tea, and her mom had gifted me with these two, incredible bracelets! I absolutely love them, and I'm going to wear them tonight for my big Scrabble game against Robie. Debbi makes and sells these bracelets via word of mouth, which I think is phenomenal (she doesn't have a website or an Etsy). 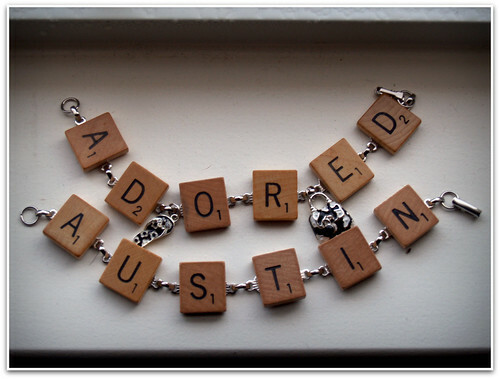 If you're interested in a Scrabble bracelet of your own, email Debbi Proctor at mrssandmn [at] aol [dot] com. She can do custom pieces up to six tiles long and she also has some that are already made. I love mine and I love that they're handmade by someone's super creative mom! Thank you, Debbi and Cassiday! as if that wasn't already obvious in my post]. Comment from Cassiday: Hey ladies (and possible gents)....this is Cassiday and I asked Mom about the bracelets, and she said she'd do them for a great price if you mention Adored Austin. Just email her and she said they'd be $15 each or $25 for two bracelets (plus shipping, but she's in the U.S., so I'm sure it'd be affordable) . If you want charms or beading, it'd be a little extra. Just wanted to pass that along.